In the new volume, Winston Churchill and Franklin Roosevelt emerge as generally willing to indulge Joseph Stalin’s demands for part of the Italian Fleet, though not to quite the extent of one-third of it. They knew that the Soviet navy would pose little or no threat to the Western powers after the war, so a share of the Italian Fleet seemed a relatively cheap way to buy Stalin’s goodwill at a time when that was a notoriously rare and short-lived commodity. But as time went on, as Stalin’s monumental ingratitude for anything and everything became more evident and the practical complications about dividing the Italian Fleet became clearer, Churchill encouraged Roosevelt to be more careful over what could be delivered. Although discussions amongst the Allies about the Italian Fleet’s surrender had been taking place for some weeks, even before their invasion of Sicily in July 1943, the first indication that the Fleet was about to be handed over came on 9 September. The news, Churchill recalled, made “an agreeable introduction” to his discussions just beginning that day with Roosevelt and the Combined Chief of Staff at the White House. At that meeting, Churchill “expressed the hope that the Italian Fleet would be treated with respect by the Allies wherever it might arrive.” He was keen that nothing should be done to alienate the new Government of Marshal Badoglio, which had overthrown Benito Mussolini. Churchill meanwhile told the his foreign secretary, Anthony Eden, who was in London: “Assuming we get the Italian Fleet, we gain not only that fleet but the British fleet which has hitherto contained it. This very heavy addition to our Naval power should be used at the earliest possible moment to intensify the war against Japan.” He instructed acting First Sea Lord, Admiral Syfret (who had relieved the ailing Dudley Pound) to confer with the Chief of the U.S. Naval Staff, Admiral Ernest King, about the way the Italian Fleet, once reconditioned, might be employed in the Pacific against Japan. 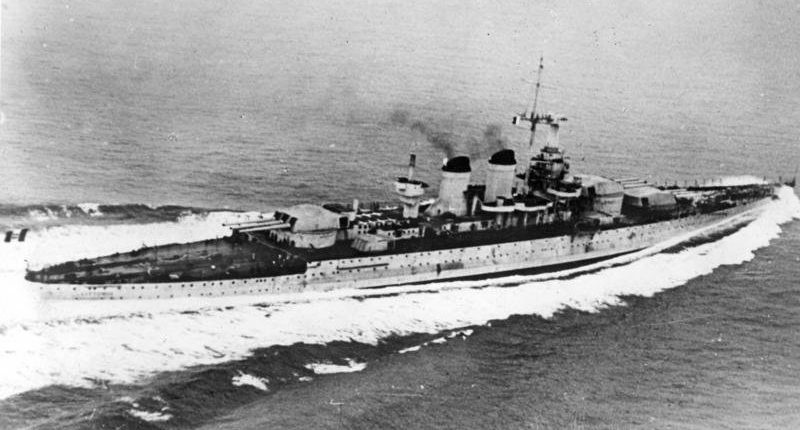 In particular Churchill hoped that no fewer than ten aircraft carriers, suitably supplemented by the Italian Littorio class battleships and smaller craft, might be able to take part in a favoured operation of his against Northern Sumatra, one which the British Chiefs of Staff profoundly opposed. We should ask now that at the end of the war these ships should be assigned to Great Britain on account of (a) Our losses in capital ships during the war; and (b) The fact that we have discontinued our building of battleships after ‘Vanguard’ in order to contribute more immediately to the current war effort. In the event of any difference between the two Powers as to the partition of the Italian Fleet, the root principle is that we share half and half. At that stage, therefore, the idea that Soviet Russia had any automatic right to any ships at all seems not to have crossed Churchill’s mind—understandably enough, since Russia had no naval presence in the Mediterranean, and no way of establishing sending ships there through then-neutral Turkey. No-one knew better the problems posed to naval ingress and egress to and from the Black Sea through the Dardanelles than Churchill himself. And after all, the Italian Fleet was not conditioned for service in the Arctic Circle, where Russia had other naval bases. the older Italian battleships, as well as our own R Class, must be considered for these purposes. It is not necessary to put them into permanent commission. They, or some of them, would be fitted as bombarding ships, which, under proper air umbrella, can be freely hazarded for the specific landing and medium support operations with which they are concerned. The Italian ships, Churchill expected, would be manned by Italian sailors under the overall command of the Combined Chiefs. By 7 October 1943, however, the Russians had indicated an interest in taking over about one-third of the Italian Fleet, a desire they communicated to Eden when he visited Moscow later that month. As Eden warned the War Cabinet on 27 October, the Soviet commissar for foreign affairs, V.I. Molotov, had requested “1 Battleship, 1 Cruiser, 8 Destroyers, 4 Submarines and 40,000 tons of shipping,” which Eden thought reasonable and worth granting quickly, not least because “an early favourable decision would be very helpful at the Moscow Conference.” Eden named a third of the Italian navy on the basis that Italy had surrendered to all three Allied powers. Although the British Chiefs of Staff weren’t opposed to this in principle, they did feel that “handing over of the ships would, however, give rise to a great many difficulties which would need very careful examination.” War Cabinet member Field Marshal Smuts of South Africa, whose views carried great weight in London, thought that it ought to be discussed by Roosevelt, Churchill and Stalin at their next meeting, at Teheran. The War Cabinet were concerned that if Molotov’s demands were met, the ships would not be used against Japan; that the ships were not conditioned for Arctic weather; that the Free French, Greeks and Yugoslavs might also make demands for Italian vessels as part of what was already being called the “United Nations” that had defeated Italy; and above all that it might “discourage Italian co-operation” if the Italian Navy and Government discovered that they were about to be handed over to Bolshevik Russia. Eden replied the same day stating—somewhat naively in the circumstances—that the Russian demands ought to be met because “There have been many signs during our Conference that the members of the Soviet Government are sincere in their desire to establish relations with ourselves and the United States on a footing of permanent friendship.” For any small proportion of the Italian Fleet that the Russians could be given, Eden thought, “the psychological effect would be out of all proportion to the value of the ships, whatever that may be.” He added that the U.S. Ambassador to Moscow, Averell Harriman, fully agreed with this stance. The scene was thus set for discussions between the Big Three at Teheran. Molotov replied that “Russia would be able to make good use of these ships, even if they were not given outright into Russian hands.” Churchill magnanimously said “this was a very small thing after all the efforts that Russia was making or had made.” He added that “The matter would have to be so arranged that there would be no mutiny in the Italian Fleet and no scuttling of ships.” He suggested that a couple of months would be enough for him and Roosevelt to handle the Italians “like a cat handling a mouse.” He asked Stalin: “In two months a battleship and a cruiser: would that do?” Stalin replied “What about the end of January?” which was almost exactly two months. Roosevelt agreed and Churchill said “yes,” promising that the ships would pass under Russian orders by that date, after refitting. Stalin said that he would hand them back after the war, presumably to Italy. Our submarine officers would think it an honour to fight side by side with the Soviet Black Sea fleet. It would only be a small contribution, but he would like to make it. The American submarines were sinking a lot of Japanese ships in the Pacific, and we in the Mediterranean had been sinking a very large number of Italian and German ships. We thought submarine warfare wicked, but we would like to do a lot more of it. In view of the ungracious tone of Stalin’s reply and evident Soviet refusal to try to understand our position which was so patiently and considerately explained, I have little doubt that they will reproach us upon the quality of these vessels. It is however the best we can do. We had undertaken to loan a battleship, the Royal Sovereign, and 20,000 tons of merchant shipping; the U.S. had agreed to hand over a cruiser and 20,000 tons of merchant shipping. These vessels would be handed over on loan until such time as Italian ships could be handed over. It was a stark sign of quite how far both Churchill and Roosevelt were willing to go to appease Stalin in early 1944, before Operation Overlord and whilst the huge preponderance of battlefield combat was being undertaken on the Eastern Front—which ultimately was where four out of every five German soldiers died in combat during World War II. I have never agreed nor have you ever asked me to agree to a division of the Italian Fleet into three shares….Averell [Harriman] was…able to assure you that nothing of the sort had been said to the Russians. You are therefore quite uncommitted so far as they are concerned. Roosevelt agreed, and suggested they tell the Italian government it was “not intended to transfer any Italian ships to Russia at present.” However on 17 March, Stalin wrote simultaneously to both Churchill and Roosevelt, saying that the issue of the Italian Fleet “is, of course, entirely beyond dispute, and the Italian Government should be given so to understand in the particular case of the Italian ships which are liable to be handed over to the Soviet Union.” Here was a direct impasse—and a dangerous one, considering that British and American troops were now less than three months from undertaking Operation Overlord. As Hillsdale Companion volume 19 closes, we find the Russians on one side of yet another thorny question, and Churchill and Roosevelt on the other. As the documents in this book make clear, the Italian Fleet issue saw the two Western leaders doing everything they reasonably could to accommodate a fundamentally unreasonable and pathologically ungrateful and suspicious Stalin. It was not for the first time, and would certainly not be for the last. About the Author: Andrew Roberts is the author of Masters and Commanders: How Four Titans Won the War in the West and Storm of War: A New History of the Second World War. His latest work, Napoleon: A Life. He is now writing a new biography of Winston Churchill.